Yuan Shikai (Courtesy Weiting 慰亭; Pseudonym: Rong'an 容庵　Traditional Chinese: 袁世凱; Simplified Chinese: 袁世凯; Hanyu Pinyin: Yuán Shìkǎi; Wade-Giles: Yüan Shih-k'ai) (September 16, 1859 – June 6, 1916) was a Chinese military official and politician during the late Qing Dynasty and the early Republic of China. Born into a prosperous family, and entered the Qing Brigade after twice failing the civil service examinations. He distinguished himself in Korea, and in 1895, after the First Sino-Japanese War, when the Qing government recognized he need to train a modern army, Yuan was put in charge first new army. He supported the Dowager Empress Cixi when she deposed the Guangxou Emperor in 1898 after the Hundred Days’ Reform, and fled to the countryside after they died in 1908 to avoid execution. The Qing government called him back into service after the Wuhan Uprising in October, 1911, but he sided with the revolutionaries and was elected Provisional President of the Republic of China on February 14, 1912, by the Nanjing Provisional Senate. On December 12, 1915, he proclaimed his reign as Emperor of the Chinese Empire (中華帝國大皇帝), but Yunnan's military governor, Cai E and several other provinces rebelled and he abandoned monarchism in March, 1916, three months before his death from uremia. Yuan is criticized in Chinese culture for taking advantage of both the Qing imperial court and the Republicans. He is known in Chinese history for his authoritarian control based on military dictatorship. He is sometimes called the “Father of Warlords” because his establishment of military provincial governors, each with his own army, is considered to be the foundation of the period of warlordism which followed his death. Yuan Shikai was born September 16, 1859, in the village of Zhangying (張營村), Xiangcheng county (項城縣), Chenzhou prefecture (陳州府), Henan province. Xiangcheng has now become the county center of Xiangcheng (項城市), under the administration of the prefecture-level city of Zhoukou (周口市). Chenzhou is now called Huaiyang (淮陽), but it is no longer the administrative center of the prefecture, having been replaced by Zhoukou. The village of Zhangying is located immediately north of downtown Xiangcheng. The Yuan family later moved to a hilly area, easier to defend, 16 kilometers southeast of downtown Xiangcheng, and there the Yuans built a fortified village, the village of Yuanzhai (袁寨村, literally "the fortified village of the Yuan family"). The village of Yuanzhai is now located inside Wangmingkou township (王明口鄉), on the territory of the county-level city of Xiangcheng. The large countryside estate of the Yuan family in Yuanzhai was recently opened to tourism by the People's Republic of China, and people inside China generally assume that Yuan Shikai was born in Yuanzhai. As a young man he enjoyed riding, boxing, and entertainment with friends. Yuan had wanted to pursue a career in the civil service, but failed twice in the Imperial Examinations. He decided that he would have to enter politics through the Army. Using his father's connections, Yuan went to Tengzhou, Shandong and sought a post in the Qing Brigade. Yuan was married in 1876, to a woman of the Yu family, who bore him a son, Keding, in 1878. In the late 1870s, Korea (Joseon_Dynasty) was in the midst of a struggle between isolationists, under the king's father (Daewongun), and progressives, led by Queen Min (Empress Myeongseong), who had wanted open trade and continued Chinese overlordship in Korea. Japan was an emerging power, with a new aggressive foreign policy which included an interest in the protectorate of Korea. Under the Ganghwa Treaty, which the Koreans signed only with reluctance in 1876, Japan was allowed to send diplomatic missions to Seoul, and opened trading posts in Inchon and Wonsan. Amidst an internal power struggle, which resulted in the queen's exile, Li Hongzhang, the Viceroy of Zhili, sent the Qing Brigade, 3,000 strong, into Korea. The Korean regent was escorted to Tianjin, where he was kept prisoner. Korea's weakness was apparent, and the Chemulpo Treaty of 1882 gave the Japanese the right to station troops in Seoul to protect their legation. China's protection alone could not shield Korea in an imperialist and fast-developing world, and it was obvious that Korea's army could not even deal with an internal crisis. The king issued a proposal to train 500 troops in the art of modern warfare, and Yuan Shikai was appointed to remain in Korea and lead this task. Li Hongzhang also recommended to the emperor that Yuan Shikai be promoted, and his new rank of “sub-prefect” was soon approved. In 1885, Yuan was appointed Imperial Resident of Seoul with orders from the Imperial Throne. The position seemed on the surface to be similar to that of an ambassador, but in practice, Yuan, being the head official from the suzerain, had become the supreme adviser on all Korean government policies. Dissatisfied with its position in Korea, Japan wanted more influence through co-suzerainty with China. A series of forged documents intended to anger the Chinese was sent to Yuan Shikai, attempting to make it appear as if the Korean government had changed its stance towards Chinese protection, and turned instead towards Russia. Yuan was skeptical but outraged, and asked Li Hongzhang for advice. In a treaty signed between Japan and China, each of the two parties agreed to send troops into Korea only after notifying the other. Although the Korean government was stable, it was still a protectorate of China, and forces emerged advocating modernization. Another more radical group, the Donghak Society, promoting a progressive early nationalist doctrine based partly upon Confucianist and Daoist principles, and advocating reforms similar to the Japanese model, rose in rebellion against the government, which Yuan wished to protect. Li Hongzhang sent troops into Korea to protect Seoul and China's interests, and Japan did the same under the pretext of protecting Japanese trading posts. Tensions boiled over between Japan and China when Japan refused to withdraw its forces and placed a partial blockade at the 38th Parallel. Li Hongzhang wanted at all costs to avoid a war with Japan, and requested international pressure for a Japanese withdrawal. Japan refused, and war began. Yuan, now in an ineffective position, was recalled to Tianjin in July 1894, at the beginning of the First Sino-Japanese War (甲午戰爭). Yuan Shikai rose to fame during the First Sino-Japanese War as the commander of the Chinese stationary forces in Korea. He was fortuitously recalled to Beijing several days before the Chinese forces were attacked, and avoided the humiliation of the Chinese armies by the Japanese. Japan declared its victory in 1895. As a result of the First Sino-Japanese War, the Qing government recognized the inadequacy of its army and the need to train a modern military force. An ally of Li Hongzhang, Yuan was appointed the commander of the first New army in 1895. The Qing court relied heavily on his army, due to the proximity of its garrison to the capital and its effectiveness. Of the new armies in the Self-Strengthening Movement, Yuan's was the best trained and most effective. The Qing Court at the time was divided between progressives under the leadership of the Guangxu Emperor, and conservatives under the Empress Dowager Cixi, who had temporarily retreated to the Summer Palace as a place of "retirement." After Guangxu's Hundred Days' Reform 1898, however, Cixi decided that the reforms were too drastic, and wanted to restore her own regency through a coup d'état. Plans of the coup spread early, and the Emperor, very aware of the plot, asked reform advocates Kang Youwei, Tan Sitong and others to develop a plan to save him. Yuan's involvement in the coup continues to be a topic of considerable historical debate. Tan Sitong reportedly met with Yuan several days before the coup, asking Yuan to assist the Emperor and rid the government of Cixi. Yuan refused a direct answer, but insisted he was loyal to the Emperor. Meanwhile the Manchu General Ronglu was planning maneuvers for his army to stage the coup. According to many sources, including the diary of Liang Qichao and a Wen Bao (文報) article, Yuan Shikai arrived in Tianjin on September 20, 1898, by train. It was certain that by the evening, Yuan had talked to Ronglu, but what was revealed to him remains ambiguous. Most historians suggest that Yuan had told Ronglu of all details of the Reformers' plans, and asked him to take immediate action. The plot was exposed, and Ronglu's troops entered the Forbidden City at dawn on September 21, forcing the Emperor into seclusion in a lake palace. After forming a political alliance with the Empress Dowager, and becoming a lasting enemy of the Guangxu Emperor, Yuan left the capital in 1899 for a new appointment as Governor of Shandong. During his three-year tenure, he ensured the suppression of Boxers (義和團) in the province. He also left the foundation for a provincial junior college in Jinan, adopting some western ideas of education. He was granted the position of Viceroy of Zhili (直隸總督) and Minister of Beiyang (北洋通商大臣), where the modern regions of Liaoning, Hebei, and Shandong provinces now are, on June 25, 1902. 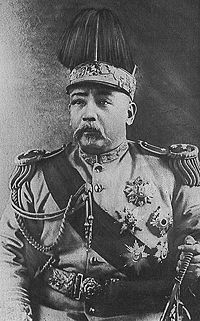 In 1903, when Japan and Russia were preparing to go to war over Manchuria (Russo-Japanese War, 1904-1905), Yuan was appointed commissioner of the Army Reorganization Council. 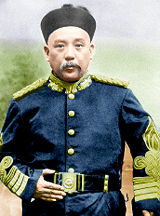 He had won the regard of foreigners by helping to crush the Boxer Rebellion in 1898, and as able to successfully negotiate a number of loans to expand his Beiyang Army into the most powerful army in China, with 70,000 soldiers in six divisions and its own Paoding (P’ao-ting) military academy. To keep order in Tianjin after the Boxer Protocol had forbidden troops to be staged within close proximity, he created a police force 1,000-strong, the first of its kind in Chinese history. Yuan was also involved in transferring control of the railways from Sheng Xuanhuai (盛宣怀), and railways became a major source of his revenue. Yuan played an active role in late-Qing political reforms, including the creation of the Ministry of Education (學部) and Ministry of Police (巡警部). He further advocated for ethnic equality between Manchus and Han Chinese. The Empress Dowager and the Guangxu Emperor died within a day of each other in November 1908. Some sources indicate that the will of the Emperor had specifically ordered that Yuan be executed. Avoiding execution, in January 1909, Yuan Shikai was relieved of all his posts by the regent, the 2nd Prince Chun (醇親王). The official reason was that he was returning to his home in the village of Huanshang (洹上村), located in the suburbs of Zhangde prefecture (彰德府), now called the prefecture-level city of Anyang (安陽市), Henan province, in order to treat a foot disease. During his three years of retreat, Yuan kept contact with his close allies, including Duan Qirui, who reported to him regularly about army proceedings. With the loyalty of the Beiyang Army still undoubtedly behind him, Yuan actually held the balance of power between the revolutionaries and the Qing Court. Both wanted Yuan on their side. Initially deciding against the possibility of becoming President of a newly proclaimed Republic, Yuan also repeatedly declined offers from the Qing Court for his return, first as the Viceroy of Huguang, and then as Prime Minister of the Imperial Cabinet. Time was on Yuan's side, and Yuan waited, using his "foot ailment" as a pretext for his continual refusal. The Wuchang Uprising succeeded on October 10, 1911 in Hubei province, before Yuan's official appointment to the post of Prime Minister. The southern provinces had subsequently declared their independence from the Qing Court, but neither the northern provinces nor the Beiyang Army had a clear stance for or against the rebellion. Both the Qing court and Yuan were fully aware that the Beiyang Army was the only Qing force powerful enough to quell the revolutionaries. The court renewed offers for Yuan's return on October 27, and Yuan eventually Yuan accepted, leaving his village for Beijing on October 30 and becoming Prime Minister on November 1, 1911. Immediately he asked that Zaifeng, the Regent, abstain from politics. Zaifeng, was forced to resign from his regency, making way for Yuan to compose a newly created, predominantly Han Chinese Cabinet of his confidants, containing only one Manchu, who held the position of Minister of Suzerainty. Yuan also demanded legal recognition for the Revolutionary Alliance (Tongmenghui) of Sun Yat-sen.
To further reward Yuan's loyalty to the court, the Empress Dowager Longyu offered Yuan the noble title Marquis of the First Rank (一等侯), an honor previously only given to General Zeng Guofan. While continuing his demands to ensure temporary political stability in Beijing, Yuan’s forces captured Hankou and Hanyang in November 1911, in preparation for an attack on Wuchang, and forced the republican revolutionaries to negotiate. Yuan Shikai as the Empire of China (1915-1916) Emperor. The revolutionaries had elected Sun Yat-Sen as the first Provisional President of the Republic of China on December 29, 1911, but they were in a weak position militarily, so they reluctantly compromised with Yuan. Yuan fulfilled his promise to the revolutionaries and arranged for the abdication of the child emperor Puyi in return for being granted the position of the President of the Republic, replacing Sun. Yuan would not himself be present when the Abdication edict was issued by Empress Dowager Longyu, on February 12, 1912. Sun agreed to Yuan's presidency after internal bickering, but asked that the capital be situated in Nanjing. Yuan, however, wanted to keep his advantage geographically. Cao Kun, one of his entrusted subordinate Beiyang military commanders, fabricated a coup d'état in Beijing and Tianjin, apparently under Yuan's orders, to provide an excuse for Yuan not to leave his sphere of influence in Zhili (present-day Hebei province). The revolutionaries compromised again, and the capital of the new republic was established in Beijing. Yuan Shikai was elected Provisional President on February 14, 1912, by the Nanjing Provisional Senate, and sworn in on March 10. Yuan placed his supporters in the highest cabinet posts. Sun Yat-sen traveled to Beijing and helped to found the Nationalist Party (Kuomintang). In February 1913, democratic elections were held for the National Assembly in which the Chinese Nationalist Party or the Kuomintang (KMT) scored a significant victory. Song Jiaoren, deputy in the KMT to Sun Yat-sen, zealously supported a cabinet system and was widely regarded as a candidate for Prime Minister. Yuan viewed Song as a threat to his authority; after Song's assassination on March 20, 1913 by Ying Kuicheng, there was speculation in the media that Yuan was responsible. The Flag of Yuan Shikai's "Great Chinese Empire"
Tensions between the Kuomintang and Yuan continued to intensify. Yuan's crackdown on the Kuomintang began in 1913, with the suppression and bribery of the KMT members in the two legislative chambers, followed by an orchestrated collapse of the KMT from local organizations. Seeing the situation worsen, Sun Yat-sen fled to Japan, and called for a Second Revolution, against Yuan. Yuan gradually took over the government, with support from his military followers. He dissolved both the national and provincial assemblies, replacing the House of Representatives and Senate with the newly formed "Council of State," and made Duan Qirui, his trusted Beiyang lieutenant, Prime Minister. The Kuomintang's "Second Revolution" against Yuan ended in disastrous failure, as Yuan's military might zeroed in from all sides on the remnants of KMT forces. Provincial governors with KMT loyalties were bribed or submitted willingly to Yuan. After his victory, Yuan reorganized the provincial governments, with Military Governors (都督), each in control of his own army, replacing the civil governorship. This laid the foundations for the warlordism that crippled China for the next two decades. In 1915, Japan sent a secret ultimatum known as the Twenty-One Demands to Beijing, which were so extensive that they would in effect make China a protectorate of Japan. Japanese fleets sailed into Chinese harbors, and Japanese troops moved into Shandong and South Manchuria. When word leaked out in May that Yuan had agreed to many of the provisions, mass protests sprang up as well as a boycott of Japanese goods. Western pressure forced Japan to back down on its demands. With Yuan’s power secure, many of his supporters, notably monarchist Yang Du, advocated for a revival of the monarchy, asking Yuan to take on the title of Emperor. Yang reasoned that the Chinese masses had long been used to autocratic rule, and a Republic had only been effective in a transitional phase to end Manchu rule. China's situation required the stability that only a monarchy would ensure. American political scientist Frank Johnson Goodnow, as well as the Imperial Government of Japan suggested similar ideas. Yuan held a carefully selected political convention which unanimously endorsed monarchy on November 20, 1915. By December 12, he proclaimed his reign as Emperor of the Chinese Empire (中華帝國大皇帝) under the era name of Hongxian (洪憲; Constitutional Abundance) to begin on January 1, 1916. He restored the civil service examination system for imperial bureaucrats. But on December 25, Yunnan's military governor, Cai E, rebelled and several provinces followed. Seeing his weakness and unpopularity, foreign powers, including Japan, withdrew their support. Faced with universal opposition, Yuan repeatedly delayed the accession rite to appease his foes. Funding for the ceremony was cut on March 1 and he abandoned monarchism on March 22. This was not enough for his enemies; they began to call for his resignation as president. More provinces rebelled, and Yuan died, humiliated, from uremia on June 5, 1916. His death was announced the following day. His remains were moved to his home province and placed in a mausoleum built to resemble Grant's Tomb. He had three sons: Prince Yuan Keding, who was handicapped; Prince Yuan Kewen, who was said by his father to be a 'fake scholar,' and Prince Yuan Keliang, whom Yuan Shikai called a "bandit." With Yuan's death, China was left without any generally recognized central authority and the army quickly fragmented into forces controlled by competing warlords. For this reason, he is often called the “Father of the Warlords.” However, it is not accurate to say that Yuan condoned other aspects of warlordism, since in his career as a military reformer he had attempted to create a modern army based on the Japanese model. Throughout his lifetime, he demonstrated an understanding of how staff work, military education, and regular transfers of officer personnel could be utilized to build a modern military organization. After his return to power in 1911, however, he seemed willing to sacrifice this ideal for his imperial ambitions, and instead ruled by a combination of violence and bribery that destroyed the idealism of the early Republican movement. Since those who opposed Yuan could do so only from a territorial military base, Yuan's career as president and emperor contributed greatly to China's subsequent political division. His extensive political power and dominating personal qualities have remained hotly debated subjects, especially after the premiere of the controversial TV series Towards the Republic. In the CCTV Production Towards the Republic, Yuan is portrayed through most of his early years as an able administrator, although a very skilled manipulator of political situations. His self-proclamation as Emperor is seen as largely due to the influence of external forces, such as his son, prince Yuan Keding. Yuan's grandson, Luke Chia-Liu Yuan, was a Chinese-American physicist. ↑ Ellen Johnston Laing, Selling Happiness. (University of Hawaii Press, 2004, ISBN 0824827643), 92. ↑ 2.0 2.1 2.2 Donald F. Busky, Communism in History and Theory. (Praeger/Greenwood, 2002, ISBN 0275977331). ↑ 3.0 3.1 3.2 Zhengyuan Fu, Autocratic Tradition and Chinese Politics. (Cambridge University Press, 1994 ISBN 0521442281), 153-154. ↑ Jonathan D. Spence, The Search for Modern China. (W. W. Norton & Company, 2001, ISBN 0393307808), 277-278. All links retrieved March 31, 2014. The Fight for the Republic in China by Simpson, Bertram Lenox This etext first published in 1917 contains a detailed account of Yuan Shikai, his rise and fall. This page was last modified on 31 March 2014, at 15:11.